Denis Gardarin Gallery is pleased to present the first comprehensive survey of work by the Austrian artist Rudolf Polanszky in the United States, opening on Friday, November 6th. The exhibition at 224 Mulberry Street in New York City will open in tandem with the previews of fall auction week and will remain on view through December 12th, 2015. Born in Vienna in 1951, Polanszky was a key figure in the Post-Actionist movement of the 1970s and remains the most important living artist of this era. Known for his process-dependent multimedia works that explore questions of free will in art and human behavior, Polanszky worked with and greatly influenced artists such as Franz West and Dieter Roth. Spanning over three decades from 1983 to 2014, Denis Gardarin Gallery’s exhibition Rudolf Polanszky: on Evolutive Concepts of Transformation traces the predominance of process over form in Polanszky’s oeuvre from his early performance-based work Coma (White) to the more recent “Reconstructions” paintings. Polanszky’s early conceptual work challenged traditional notions in art. The artist used lard, animal footprints, coil springs, or his own body rather than paint and brushes alone. In his critical 1983 work Coma (White), which has never been shown before and will be central to the exhibition, the artist relinquished creative control and submitted himself entirely to his body’s movements. Wearing a bodysuit covered with paintbrushes and sponges, he rolled around on a paper creating a painting that is devoid of conscious imagination or of a specific desired outcome. Liberating himself from intentionality and predictability, Polanszky freed himself from his own restraints. Coma (White) is thus created entirely by his surrender to an idea. This work includes sequential video stills of the performance, the bodysuit used, as well as the resulting conceptual painting. Polanszky’s work deals explicitly with the tensions between planning and randomness in the artistic process. 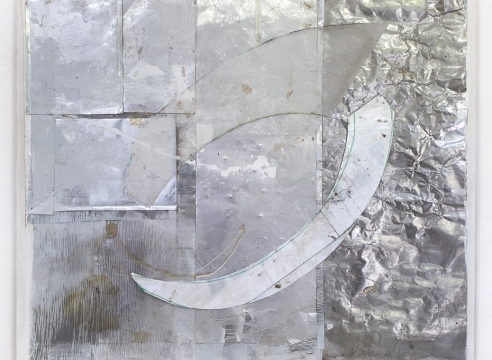 His paintings investigate the processes by which behavior is unconsciously guided, or in his words, “externally directed.” This post-modern practice is fundamental to the artist’s more recent “Reconstructions” series, in which Polanszky explores the three-dimensional topology of canvases created by the confrontation between various materials. In addition to paint, Polanszky uses textiles, plexiglass, wood, plastics, asphalt, foil, and other materials that have been freed from their functions. In a process the artist refers to as “ad-hoc synthesis,” Polanszky transforms these found and used materials into spontaneous structures, assemblages, and collages. As with his early performance-based works, “Reconstructions” successfully eliminates the influence of conscious imagination, best reflected in one of the artist’s largest and most ambitious paintings, Drifting and Sliding Picture, from 2014. Denis Gardarin Gallery’s exhibition Rudolf Polanszky: on Evolutive Concepts of Transformation follows the artist’s first European retrospective, Rudolf Polanszky: Translinear Sculptures at the Zeit Kunst Niederosterreich in Krems, Austria, earlier this year. The exhibition was accompanied by a full-length catalogue published by Kerber Verlag and edited by curator Alexandra Schantl, including an essay by Francesco Stocchi. Polanszky’s work has also been exhibited at the Centre Pompidou in Paris, the NewBridge Project in Newcastle, the 21er Haus Österreichische Galerie Belvedere in Vienna, the Nouveau Musée National de Monaco, the Museum of Modern Art in New York, the Museum of Fine Arts in Boston, and the Carnegie Museum of Art in Pittsburgh. There will be a vernissage and wine reception on Thursday, November 5th from 6 to 8PM. Rudolf Polanszky: on Evolutive Concepts of Transformation will be open Wednesdays through Sundays from 11AM to 7PM from November 6th to December 12th at 224 Mulberry Street, New York, NY 10012.